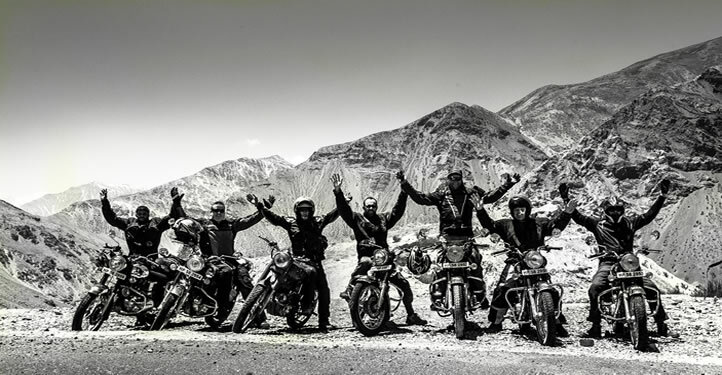 When embarking on bike tours to Leh Ladakh, many seasoned riders like to bring their own motorcycle along (if possible), as they are familiar with the vehicle and are unlikely to experience any issues. Other riders like to hire a motorcycle after arriving in India that is similar to that which they ride at home for the same reasons. Regardless of which option you have selected, there are a number of things you should do to ensure that the bike is prepared. • Air Filter/Spark Plug – If your air filter and/or spark plug are over 10,000km old (or close to it), we recommend getting them changed and keeping the old ones as spares. • Brake Shoes/Pads – You should have the brake shoes and pads checked for wear; if they won’t last another 5000km, have them changed. You should also change or top up the brake fluid. • Clutch/Accelerator Wires – If your clutch and accelerator wires are over 10,000km old (or close to it), we recommend getting them changed and keeping the old ones as spares. If they are still good, have them lubricated. • Clutch Plates – These must be in good condition, otherwise you might be unable to climb steep, hilly roads (which are everywhere in Ladakh). They should be checked and replaced if there is little life left in them. • Con Set – This is actually an essential component of your bike and, if it’s loose or worn out, it can actually affect its handling. You should have this checked and changed (if required). • Drive Chain/Sprockets – You will need to inspect the drive chain and sprockets for signs of wear. If any components appear to be on the way out, you should change the entire set. Otherwise, clean and lubricate. • Electrical/Battery – You should have all of the electrical wiring and bulbs checked to ensure they are operating properly. You should also ensure that the battery is in good working order. • Engine Oil/Filter – If your oil is over 500km old, change it. We also recommend that you change the oil filter. If your motorcycle uses an oil strainer, we recommend having it cleaned. • Piston Rings – If your bike has been consuming a lot of engine oil of late, it is recommended that you inspect the piston-cylinder kit for wear. Make sure the rings are replaced if necessary. • Suspensions – Keep in mind that the harsh terrain of Ladakh combined with a rider and luggage can really do a number of your suspension; we recommend having both the front and rear checked first. • Timing Chain – A loose or worn out timing chain can cause mechanical failure during the tour or make your motorcycle perform well below its optimal levels; ensure it is inspected thoroughly. Whilst there are certainly a number of other areas and components that require attention prior to bike tours to Leh Ladakh, those that we have outlined above tend to be the most important. We also recommend that you learn how to perform some minor repairs and servicing, as this will ensure that your bike remains on the road during the demanding journey. You should also perform a number of checks on the vehicle each day before setting out.